Columbia College’s New Mobile Phone Application! Columbia College is pleased to introduce you to the college’s new mobile phone application! This free mobile app provides you with a new way to access connectColumbia, Canvas, request a refund, and find your way around campus with maps. You will be able to view your schedule or your grades, search for classes, look up information on parking, bus and shuttle transportation, important campus phone numbers and much more. Android devices running system version 4.3.0 or later. Kindle Fire devices, except 2011 model. On your cell phone go to the app store (Google Play, Apple App Store or Amazon (Kindle Fire) ) and download/launch Ellucian Go. Open the menu in the top left corner to see a list of applications available. You will notice that several applications (class schedule, grades and restrictions) have a “locked” icon on the right. Grades prior to 2004 are not available for viewing on the app. Your connectColumbia login and password will unlock these applications. Under the heading “How to Videos” you will find an Ellucian Mobile Demo that can assist you in navigating the new mobile app. We hope you enjoy using the Columbia College Mobile App. This entry was posted in Campus News on April 25, 2017 by Cari Craven. 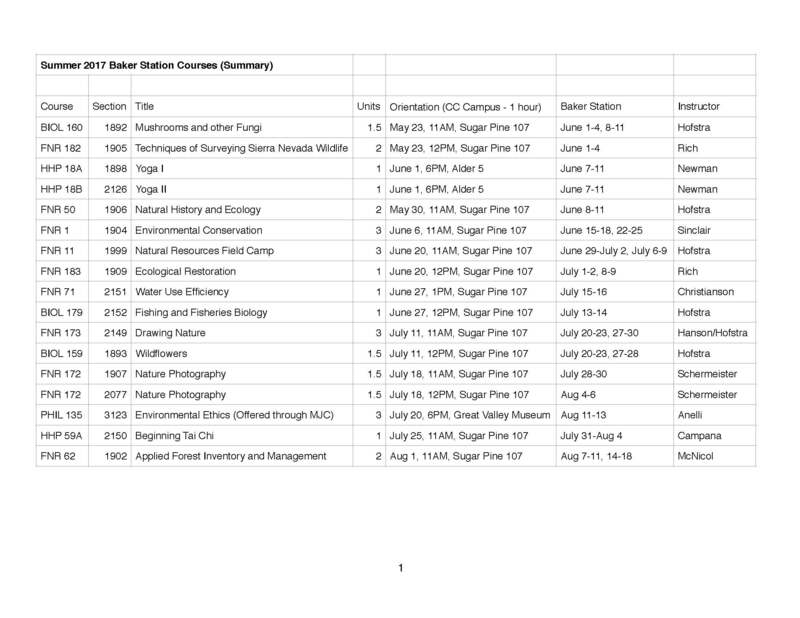 The High Sierra Institute offers over a dozen courses. The High Sierra Institute is a partnership between the Yosemite Community College District and the US Forest Service operated under Special Use Permit on the Stanislaus National Forest. Baker Station is situated along Highway 108 in the high Sierra at an elevation of 6,200 feet in the Summit Ranger District of the Stanislaus National Forest. Classes are held with field studies from May – August 2017. From Sonora: Take Highway 108 roughly 57 miles east (just under four miles BEYOND the Dardanelle store.). Baker Station sits on the north side of the road, just past a big yellow Caltrans sign. Look for a line of rustic cabins with a dirt parking lot at the end of the row of buildings. There is also a sign that reads, “High Sierra Institute at Baker Station.” If you reach the Kennedy Meadows turnoff on the right, you have gone a quarter mile too far. This entry was posted in Campus News on April 20, 2017 by Cari Craven. The Columbia College Foundation and its community partners will present more than $100,000 in scholarships to qualified and deserving students at the annual Columbia College Scholarship and Awards Celebration on Thursday, April 13. The event features student and community speakers, musical performances and presentation of the Student of the Year awards. In the 2016-2017 academic year, the Foundation and community partners awarded more than 150 scholarships to more 90 students, totaling more $100,000 in support for their educational expenses. Many of these scholarships are contributed by community organizations and individuals, many are offered annually through the Foundation’s endowed funds, and more than 20 each year are funded through the Foundation’s Osher Scholarship Endowment, established in partnership with the Bernard Osher Foundation, the Foundation for California Community Colleges and community donors. It is a point of pride for the college to have many campus donors – three student clubs sponsor annual scholarships, as well as employee groups and dozens of individual faculty members and staff. This entry was posted in Campus News on April 12, 2017 by Cari Craven.